The California Public Interest Research Group (CALPIRG) Students at UCR gathered at the Bell Tower last Wednesday, Jan. 30 to raise awareness of neonicotinoids and their dangerous effects on bees as part of CALPIRG’s ongoing “Save the Bees” campaign. CALPIRG Students at UCR have lobbied to ban neonics since fall of 2018. Neonics are nicotine-based insecticides that “end up both disorienting the bees and weakening the bees’ immune system,” according to what Mya Ho, UCR alumni and CALPIRG member has said to the Highlander in the past. At 12:10 p.m., the CALPIRG tabling group walked over to the Bell Tower to symbolize what happens to bees because of neonicotinoids every year. In a past Highlander interview Caldera has said that “30 to 40 percent of our bee colonies are dying off each season and that just shouldn’t be happening.” To show this at the Bell Tower, 40 percent of the bee-like CALPIRG students (five of 13) “died” by lying on the ground for two minutes. 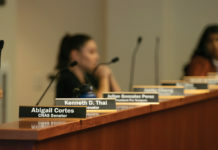 CALPIRG at UCR previously tabled back in Nov. 2018, pitching to students at the time that “if there are no bees, then there would be no Thanksgiving.” The goal of that tabling session was to collect photo petitions for a collage that Jose Medina, Assemblyman for District 61, would receive in the goals of convincing legislation to ban neonics. Caldera told the Highlander that 108 photo petitions were collected last Wednesday, well above their goal of 80. 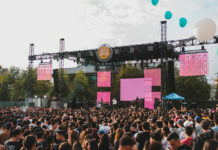 She said that at least 900 written and photo petitions have been made in total by the UCR campus to be “bee-friendly,” further writing that “we are taking time this quarter to start the process of becoming bee friendly. 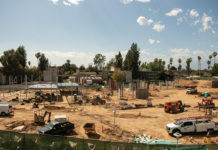 The first step is to create a committee comprised of faculty, student groups, students, and landscaping staff.” Tabling ended for CALPIRG that Wednesday around 2 p.m.
CALPIRG Students at UCR’s core meetings take place every Thursday from 7 to 8 p.m. in the Bear’s Den.